We've been negative or at the very least critical in the last few postings when it comes to talking about SummerSlam. So I'm putting all the illogical booking and lack of card buildup behind me and focusing on the past. Let's go back in time 20 years to SummerSlam '91. The main event of course was Hulk Hogan and the Ultimate Warrior vs. Sgt. Slaughter, Col. Mustafa, and Gen. Adnan. The show was also highlighted by the wedding of Randy Savage and Miss Elizabeth. But without a doubt the best match on the card was Mr. Perfect defending the Intercontinental title against Bret Hart. This was 1991, and I had just moved away to college. My roommate's mom taped the show for us and we had to wait and watch it when we were back in town the following weekend for Labor Day. I remember before the match started, I specially argued that there was no way that Mr. Perfect would lose to Hart. My logic was simple. Hart had mostly been a tag team wrestler except for a brief feud with Bad News Brown a few years earlier. He had jobbed several times in that program. Perfect was at the top of his game. Or so I thought. Little did we know at the time, Curt Hennig was dealing with major back problems. This was to be his last match for nearly two years. Remember this was long before the Internet was around. Hart and Hennig stole the show. They were the second match on the card and put on one hell of a show. It was the best IC title match since the Ricky Steamboat-Randy Savage at Wrestlemania 3. Just thinking out loud it may be the best SummerSlam match in the history of the event. Of course, Hart stole the show a year later again in a match for the IC title. This time, he was defending against his brother-in-law Davey Boy Smith. 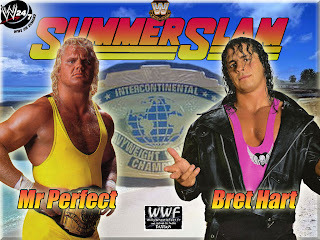 It's safe to say that the win over Perfect in 91 set the course for Bret Hart. His stock immediately went up, despite getting saddled with some sub par opponents early on (Skinner and the Warlord come to mind). He had made that successful transition from tag team wrestler to singles superstar. Hart paved the way for others like Shawn Michaels, Booker T, and Jeff Hardy. This was back when the Intercontinental title meant something. As of this posting, there is NO IC title match on the card. Or U.S. title match. Or tag team title match. It's a sign of the times. Four matches and a concert is all we have. So today, I chose to remember a blast from the past and two of the all time greats of the wrestling business. Thanks Hitman and Mr. Perfect for helping me remember what it was I love about wrestling. Leave comments here. Or head over to our Facebook page and like it. Follow us on Twitter. And don't forget to subscribe to the YouTube channel.